This spacious, modern villa has a contemporary look and feel. 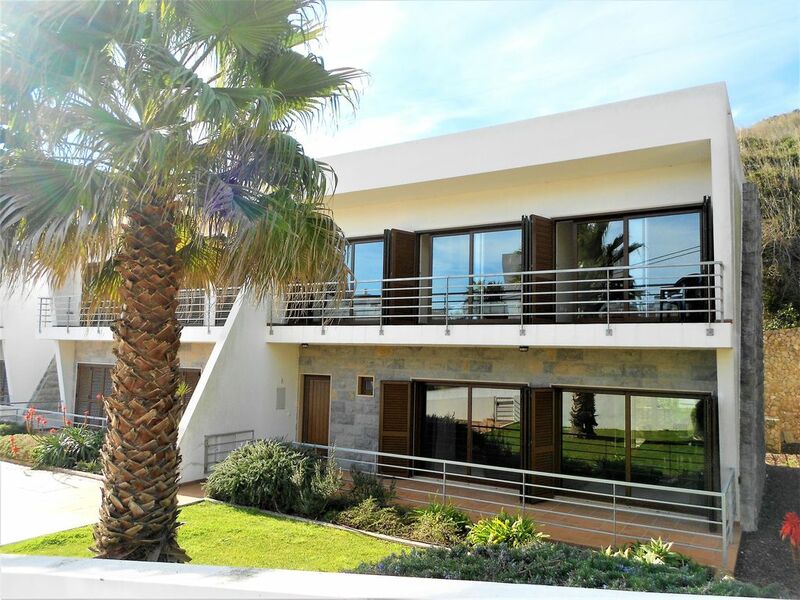 Set in the idyllic town of Foz do Arelho, between the village and the beach, it provides a luxurious and comfortable base for you to relax and enjoy the many sights and activities available in Foz do Arelho and the surrounding area. The villa is finished to an exceptionally high standard with 3 bedrooms, 3 bathrooms, lounge/dining area, fully fitted kitchen and garage. The property benefits from landscaped gardens, a secure, shared pool and a private, outdoor patio with brick built BBQ and dining. The town’s location offers excellent access to water sports - surfing in the Atlantic or bathing, windsurfing and canoeing in Obidos Lagoon which offers a calm and shallow alternative. Praia D'el Rey golf course (European Golf Resort of the year 2007) is 25 mins drive away and the Golden Eagle course is in nearby Rio Maior. With the Euro buying more here than most places in Western Europe, this is the ideal holiday destination. En-suite to bedroom 1 - bath/shower, wc, vanity unit, wash basin. Main 1st floor bathroom - bath/shower, wc, vanity unit, wash basin. Ground floor wash room/cloakroom - wc, wash basin. Basement shower room - shower cubicle, wc, wash basin. Gas Hob. Electric grill in oven. Fully fitted beech wood kitchen with the following integrated appliances: four ringed hob, cooker hood extractor fan, fan assisted oven and grill, large fridge/freezer, microwave, dishwasher, double sink, kettle and toaster. Praia del Rey - 25 min drive - Obidos. Founded 1997. Holes 18. Length 4731m (Red) 5216m (Blue) 5586m (Yellow) 6056m (White) 6467m (Black). Par 72. SSS: 72 Atlantico – 30 min drive - Peniche. Founded 1996. Holes 9 (18 different tees). Length 4839m. Par 72. Golden eagle - 20 min drive - Rio Maior. Founded 1994. Holes 18. Length 5597m. Par 72. SSS 71. Notes on accommodation: A cot, highchair and changing mat can be made available for your stay - please request when booking. iPod docking station allows you to bring your iPod and choose from your entire music collection on holiday. There is a secure digital safe for you to store passports, money etc. No Pets. No smoking. Outside: The infinity pool is 6 x 3 metres. The villa benefits from landscaped gardens, palm tree and rockery to the front. There is ample space to sunbathe by the pool on the sun-loungers or read a book in the shade on the patio. The rear patio provides private alfresco dining, with it's brick-built BBQ and outdoor dining table and chairs. Utility Room: Washing machine and drying area with wash basket, clothes horse, iron and ironing board. Cleaning / Towels / Linen / Maid service: Bedlinen and bath towels provided. Please provide your own beach and pool towels. For stays of over one week, a mid-stay maid service can be made available at an extra cost. This service includes a laundry change and/or villa clean. Request when booking. Other: The huge underground garage provides ample parking for at least 3 cars. With the basement shower adjoining it, this is the ideal entry point after a day at the beach. Beautiful spacious apartment with fab pool. A beautiful apartment with fab size bedrooms and plenty of bathrooms for the kids . On a bit of a incline so wasn’t the best for my older mother as she couldn’t get around as easy as she would of liked. In a very quiet area but ideal base to jump on motorway to Peniche, Obidos , San Martinho and even Nazare. Had a lovely week even had English TV for the kids . Thank you for a lovely week in your apartment. Good spacious villa with shared pool and own patio and bbq. Great spot for families as 10 mins walk to gorgeous beach on the lagoon with bars and restaurants there. Villa well set up and nice pool. We enjoyed our holiday in Foz and this villa was a good base. It was spacious, very clean and convenient for the beach, the village and the lagoon. Matt was extremely helpful through the booking process, as was the local agent when we were there. There is plenty to do in the local area and so would recommend. Fantastic, modern, spacious villa in a lovely traditional portuguese village! The villa is fully equipped with everything you could possibly need, Great size bedrooms, plenty of bathrooms and a lovely open plan kitchen dining area..however as eating out was so cheap in the area that we didn't bother cooking! The villa is on a main road but its a really quiet spot and only a short walk into both Foz or to the beach where there are a nice selection of restaurants. The pool was lovely and very quiet, we had it to ourselves for the majority of the holiday. Would highly recommend for anyone looking to experience traditional portugal in a lovely villa. The villa was just as we had hoped - well appointed with all the comforts of home, including very comfortable beds! The view of the lagoon from the villa is excellent too. Its location is ideal for everything - an easy walk into Foz do Alreho village and also along to the beach and lagoon, with lots of choice of beach bars and restaurants. We hired a car and explored the surrounding area - and enjoyed Peniche for the surf, Obidos, Nazare and Caldas de Rainha - all of them very accessible. We had a lovely relaxing week, but will remember next time that it gets a bit chilly in the evenings on the Atlantic coast! The calm, tranquil waters of Obidos Lagoon are a 5 minute walk from the villa. The lagoon provides everything from safe bathing for children to water sports to the seafood on your plate for evening dinner! Venture a little further (10-15 min walk) and you will discover the rolling waves of the Atlantic ocean as a backdrop to the seemingly endless coastline. Faro Airport - approx 4 hour drive south. Lisbon Airport - approx 1 hour drive south. Oporto Airport - approx 3 hour drive north. Car hire is pretty essential, particularly if you would like to explore any of the surrounding towns/cities. Obidos, a medieval, white-walled town is approx 12km away. It is well-worth seeing and was originally a wedding present to a Queen! Coimbra to the north - 2 hour drive - is a 2 centre university city, with the old parts on the hill above the new. Cascais and Sintra on the coast to the west of Lisbon are superb places to visit too. Immediate vicinity: Foz has a mini-market, bar/cafes, restaurants, health centre, tourist office, pharmacy, a bank and a fishing tackle shop. The Central Bar is a great place to watch any live sports events, including many live Premiership Football matches. The bigger centre of Caldas da Rainha is 15 mins drive and has restaurants, supermarkets, daily fruit and veg market, cinema, train and bus stations, hospital, hotels, a park. Obidos – 15 km – 20 min drive - once the wedding present of a queen, the preserved medieval town of Óbidos is without doubt one of Portugal's most classic walled settlements. Walking the ramparts, visitors can enjoy views of windmills, vineyards and surrounding farmlands. In the residential area below, narrow cobblestone streets are lined with whitewashed houses sporting terracotta roofs. The shops are piled high with local handicrafts, while in spring the town is ablaze with geraniums, morning glories and bougainvillea. Sao Martinho do Porto - 20 min drive - the main resort along the coast between Peniche and Nazare. This is very much a tourist resort that provides many activities to keep you amused. Sailing, surfing, parapenting, hang-gliding, canoeing, mountain biking, walking, rock climbing and golf are all available here. Day Trips: Fatima – 104 km – about an hour’s drive inland - the small town of Fatima, with more than 2 million pilgrims a year, is one of the most visited Marian shrines in the world today. In 1916 and 1917 a series of apparitions were seen by three young children that were to profoundly alter both their own lives and the atmosphere of the peasant village. Berlenga Islands - Boats depart from Peniche - 25 min drive - a marine reserve classified by the Council of Europe as a 'Biosphere Reserve'. The archipelago consists of a large island, Berlenga Grande, and some small granite islands and rocks 7 miles from land. Crossings take approx 30 mins. Booking Notes: 25% non-refundable reservation deposit. Balance due a minimum of 6 weeks prior to arrival. If booking less than 6 weeks prior to arrival, full balance required at time of booking. Please note a security deposit of £200 will be required with balance. This will be returned within 10 days of departure date. Reduced Rates for stays of 3 weeks and longer. Payment can by made by cheque or bank transfer. Changeover Day: Changeover day is flexible, unless it overlaps with an existing booking. If new people are arriving/leaving, then the following times should be adhered to - arrive after 4pm and depart prior to 10:30am. Notes on prices: Prices per week in UK Pounds include electricity, gas and water. To and from dates are inclusive. Discount given for 3 week stays and longer. Shorter stays available on request.